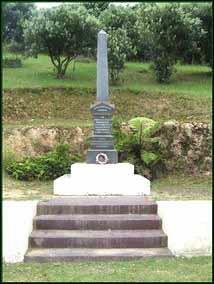 The Te Rawhiti War Memorial was built and unveiled in 1946 in memory of the men from Te Rawhiti who died in two world wars. Note its position to the side of the atea. This position changed to a central one when the wharehui was moved 26 feet (about 8 metres) towards the bank in 1969, which meant the stone was left in the middle of the formal entry or atea. 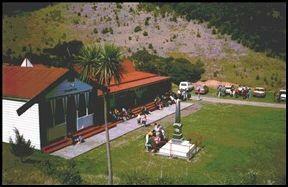 Later the stone was moved to the hillside adjacent to the Wharehui, to provide a clear entry to the wharehui. 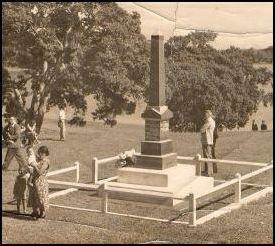 The memorial in the 1950s. The memorial today.